ALREADY many thousands of motorists have seen the "better than ever" film which illustrates Austin activities at home and abroad as well as some remarkable scenes of actual car manufacture at Longbridge. If you have not seen "Take the Wheel" ask your local Austin Agent when it is to be shown in your own neighbourhood but be sure you do not miss it. During Feb­ruary readers will have the opportunity of seeing the film in Liverpool, Bournemouth, Rochdale, St. Albans, Hull, Ramsgate, Southall, Southampton and Llandrindod Wells. On February 7th Bournemouth Imperial Motors Ltd Old Christchurch Road, Bournemouth, have arranged to give a performance of "Take the Wheel" at Bournemouth Electric Theatre. Since their appointment as sole Austin Distributors in November, 1924, this firm has consistently progressed. 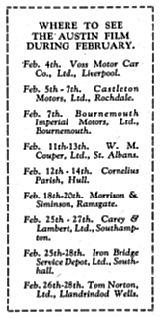 Then, few cars were sold in Bournemouth, but today the town is one of the most “motor minded” centres in the country. 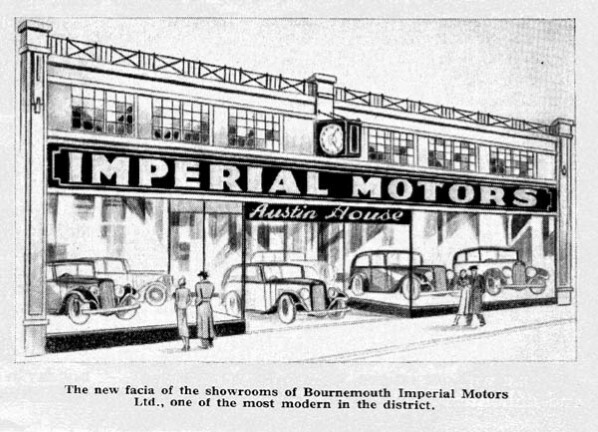 Year after year, sales have increased without exception, and last year "Imperial Motors" broke all records by a leap of £20,000 increase in turnover over 1934. In a period of little over ten years this firm has more than quadrupled the size of the premises. During the past few weeks £4,000 has been expended on modernising the showrooms, rebuilding the-service station, enlarging the used showrooms and installing up-to-date new service plant. The policy of giving a service worthy of Austin prestige has un­doubtedly contributed largely to the success of Imperial Motors and Austin cars in Bournemouth. The fascia of the showrooms at 185-187 Old Christchurch Road is now one of the most modem in the district and is carried out with the aid of a new luminous paint process which is both striking and effective, especially at night time. Austin owners are particularly invited to inspect these new showrooms, and to take full advantage of the 100 per cent Austin service in which Bournemouth Imperial Motors, Ltd. are specialists. All kind of repairs, including electrical work, coach-painting and cellulosing are executed actually under one roof at 185-187 Old Christchurch Road, the service station entrance being at the rear of the show­rooms in Lorne Park Road. The telephone number is 5705-6 in case you are requiring a demonstration!